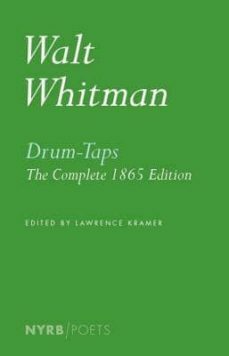 Walt Whitman worked as a nurse in an army hospital during the Civil War and published "Drum-Taps," his war poems, as the war was coming to an end. Later, the book came out in an expanded form, including "When Lilacs Last in the Dooryard Bloom'd," Whitman's passionate elegy for Lincoln. The most moving and enduring poetry to emerge from America's most tragic conflict, "Drum-Taps" also helped to create a new, modern poetry of war, a poetry not just of patriotic exhortation but of somber witness. "Drum-Taps" is thus a central work not only of the Civil War but of our war-torn times. But "Drum-Taps" as readers know it from "Leaves of Grass" is different from the work of 1865. Whitman cut and reorganized the book, reducing its breadth of feeling and raw immediacy. This edition, the first to present the book in its original form since its initial publication 150 years ago, is a revelation, allowing one of Whitman's greatest achievements to appear again in all its troubling glory.